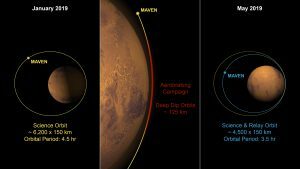 The 4-year-old atmosphere-sniffing MAVEN mission is embarking on a new campaign today to tighten its orbit around Mars. The operation will reduce the highest point of the MAVEN spacecraft’s elliptical orbit from 3,850 to 2,800 miles (6,200 to 4,500 kilometers) above the surface and prepare it to take on additional responsibility as a data-relay satellite for NASA’s Mars 2020 rover, which launches next year. A strong telecommunications antenna signal is not the only benefit of a tighter orbit. Coming in nearly 1,000 miles (about 1,500 kilometers) closer also will allow the MAVEN orbiter to circle Mars more frequently—6.8 orbits per Earth day versus 5.3 previously—and thus communicate with the Mars rovers more frequently. While not conducting relay communications, MAVEN will continue to study the structure and composition of the upper atmosphere of Mars. “We’re planning a vigorous science mission far into the future,” Jakosky said. 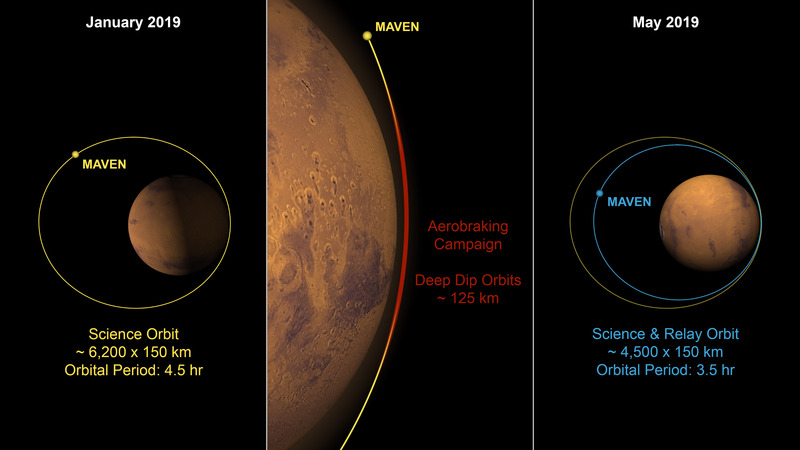 The MAVEN mission was designed to last two years in space, but the spacecraft is still operating normally. With the mission managing its fuel to last through 2030, NASA plans to use MAVEN’s relay capability as long as possible. The MAVEN orbiter carries an ultra high-frequency radio transceiver—similar to transceivers carried on other Mars orbiters—that allows it to relay data between Earth and rovers or landers on Mars. The MAVEN spacecraft already has served occasionally as NASA’s communication liaison with the Curiosity Rover. Over the next few months, MAVEN engineers will use a navigation technique known as aerobraking—like applying the brakes on a car—to take advantage of the drag of the Red Planet’s upper atmosphere to slow the spacecraft down gradually, orbit by orbit. This is the same drag you would feel if you put your hand out of the window of a moving car.